This is a fantastic chicken Taco Recipe all the way from the heart of Mexico and a little town known as Agua Dulce. Ok, so maybe it has been altered a little but still, it's a very good recipe and well worth your attention. Cut the chicken into small strips and add to the frying pan and fry gently for another 5 minutes. Add the cup of salsa and some chilli powder. Add the chopped peppers and keep cooking and stirring unitill the chicken is cooked through. Then add the black beans and a little salt and pepper. Simmer the mixture gently for about 3 minutes and then spoon it into the taco shells in time for serving. 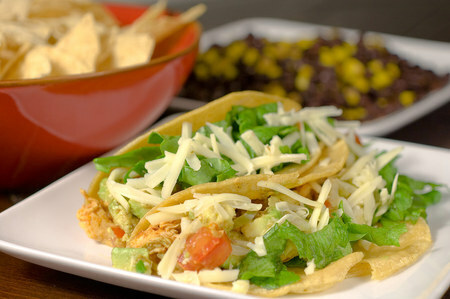 Serve with the fresh lettuce, Guacamole, salsa, grated cheese and chopped tomatoes. TIP: Serve with fresh coriander for that extra flavor. Congratulations! You have just made an authentic Mexican dish in your own home. The kids are gonna think you awsome, trust me!